On Thursday, January 30th, Trinity College School welcomed two very special guests, George and Lara Brady, to talk to Grade 9, 10 and 11 students about the story of Hana’s Suitcase. Lara Brady, the niece of Hana Brady, told the story behind Hana’s Suitcase. A teacher from Tokyo, Fumiko Ishioka, was building a Holocaust memorial at her school in Tokyo, and was sent a suitcase from Auschwitz. By reading and looking through the suitcase, she found out that this suitcase had belonged to Hana Brady. After being given this information, Ms. Ishioka discovered that Hana’s brother, George, had survived the Holocaust and was still alive. Ms. Ishioka met George and his family and they began going around to schools telling the story of Hana’s suitcase and the Holocaust. 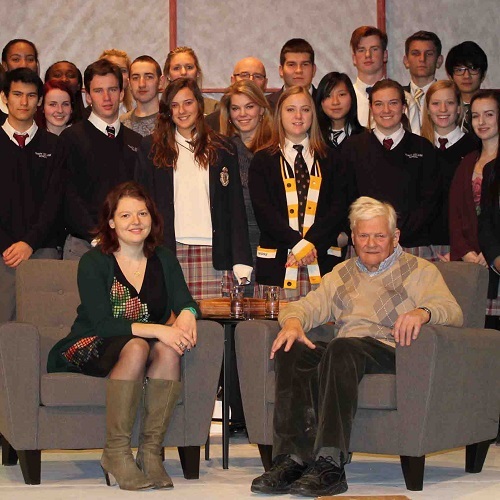 When George Brady spoke, he gave the students an idea of what a normal day in a concentration camp was like. Mr. Brady also explained what food he was given daily and the labour that he had to do. He described the horror of the gas chamber and the total lack of humanity present. The students were given a better picture on how hard, cruel and scary the Holocaust was. The message given was that students need to keep spreading this story and never forget what happened, in order that this sort of thing does not get repeated. View the Guest Speakers: George & Lara Brady ’14 gallery for more photos.